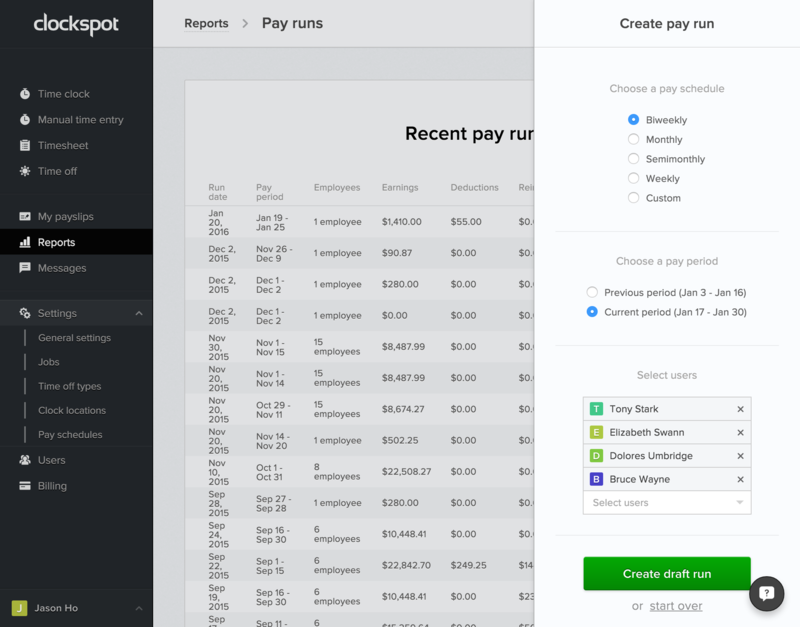 Pay schedules make it easy for you to pull payroll reports by telling Clockspot how often you pay your employees and when. It helps you automatically compute the next pay period so you don’t have to manually select the date ranges every time. You can add a pay schedule by going to Company > Pay schedules (in the main left menu), then clicking “Add pay schedule” at the top right. Common pay frequencies include weekly, biweekly (every 2 weeks), monthly, and semimonthly (twice per month). Once you add your pay schedule, you’ll see the option when you create a pay run (Reports > Pay runs, then click “New pay run” at the top right corner). Selecting a pay run will auto-fill the appropriate dates and users. If you need to edit a user’s pay schedule, go to Users > Choose a user, then click on the “Settings” tab.